I mean to post this a while ago, but here goes. At the end of last fall season fall I traded in my Croker S4 Superlights for new Arrow S40s. It was time to replace the collars on my existing oars anyway, and I had talked to Greg Doyle about the anticipated S40 model, which combines a standard-modulus carbon shaft with the Arrow blade. I had used the Arrow S39s (high-modulus) at Red Bull High Stakes, and they were so light that I felt like I was rowing with matchsticks on a windy day, so I wanted to try the heavier model with standard stiffness. Blade grip on the water is outstanding, and much, much better than the S4 Slick blade. The lock on at the catch is so soft and quick that it reminds me of rowing with Dreher macon blades “back in the day,” to the point where I have to double-check to make sure I am not rowing it in. With the Slicks, I would sometimes have the blade start to slip during the middle of the drive in rough conditions or when I was rowing poorly, but the Arrow blades are rock solid. This has made it easier to catch with the speed of the boat, maintain a fully buried blade through the finish, take it out square. Blade weight is noticeably heavier, but I like this. In the single, stability out of the water is improved at the cost of 150 grams of weight – which is a tradeoff I’m willing to make. I have a much better sense of a solid platform with squared blades at max extension before the catch. They also create less drama when I clip an object in the water with my blade on the recovery such as a buoy or log. Aerodynamics are much better. I row on a long, narrow venue that can sustain pretty high winds before the water starts whitecapping, so I sometimes row in winds that would call for an ergo day on a lake with more fetch. The S4s had a tendency to “lift off” on the recovery when hit by a sufficiently strong quartering head gust. The Arrows are again rock solid – I have not yet had a wind-induced missed catch. I realize that oar selection is a matter of personal preference. For me, the Arrow S40s are a clear upgrade over the S4 Superlights. US Women’s 8 – Why Is No One Talking About Them? This seems like a no-brainer, but they seem to be getting a lot less press than “will the Men’s 8+ qualify for Rio” etc. etc. U.S. Women’s sweep rowing has built an unprecedented dominance in their sport – arguably the longest world/Olympic championship streak of any sport in history, men or women. This is an astonishing achievement. Where is the press? Where is the awareness outside of the relatively small rowing community? As a father of daughters, equal time, equal pay, and equal status are big deals to me. Let’s give them the public awareness and support they deserve as they go to Rio to defend the biggest winning streak of all time. You can watch live or select an event number to view after the fact. 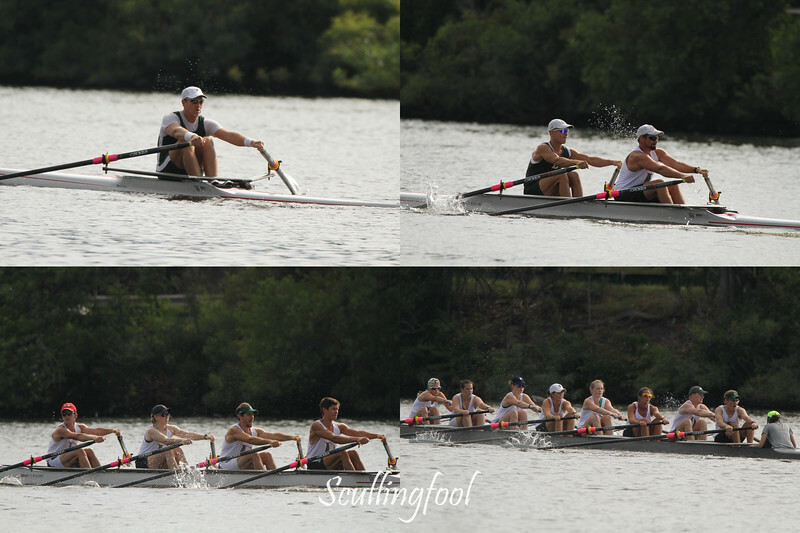 My race is the Senior Master 4+, Saturday 10:44 AM, bow #4, Ever Green Boat Club, bow seat. Red Bull High Stakes wrapped, good luck at Worlds! Red Bull High Stakes is a wrap with Ever Green topping the alumni-focused crews and coming in 6th out of the 14 teams. I was a little skeptical of the event, but it turned out to be well-run, smoothly organized, and with a ton of rolodex crews that were the Who’s Who of anybody who wasn’t currently going to worlds (and some who were)! There was a wide mix of teams – elites, alumni/ae, adaptive, veterans, and clubs, which made for exciting racing. Even the elites were not immune from mishap (e.g. the Graves brothers getting divebombed by geese). The vibe was causal, Riverside was a great host, and Sean Wolf was a great ringleader. I was definitely one of the older athletes, and it was fun to mix it up with the young guns. Good luck to Dave Smith and Phil Henson who were a couple of days away from a plane ride to Aiguebelette in the ML8+, and I hope to do it again next year! Red Bull High Stakes Tomorrow in Boston! Tomorrow is the Red Bull High Stakes, a crazy “extreme rowing” event in an unusual short-distance relay stake race format. If you are in the Boston area come down to Magazine Beach in Cambridge and check it out. As you can tell from the lack of posts this summer, I haven’t been doing much traditional CrossFit – only rowing in preparation for USRowing Masters Nationals, which is the “big game” for rowers my age. I have followed a training model that is more like CrossFit Endurance than the traditional rowing model, so we’ll see if that pays off. Multiple short sessions focusing on sprint training vs. long steady-state. The main difference has been in my emphasis on on-water skills vs. pure fitness/strength. We’ll see if it worked – the racing starts tomorrow on the Cooper River in Camden, NJ. It’s a lot of volume with heats, semis, and finals, so that’s where the CrossFit base will hopefully pay off. If anyone else is going to be there, shoot me a note and let me know what club you are with and when you are competing, and I’ll try to meet you in person. What’s my competition food plan? Most of the time it’s impossible to eat a real meal at these events, so it’s a hodgepodge of snack-size food that doesn’t need to be refrigerated and I can keep in a cooler. Whole foods good morning muffins – mostly oil, carrots, and eggs – when I need something with some fat in it for staying power that won’t upset my stomach. NK SpeedCoach GPS, although I generally don’t look at it during a race.